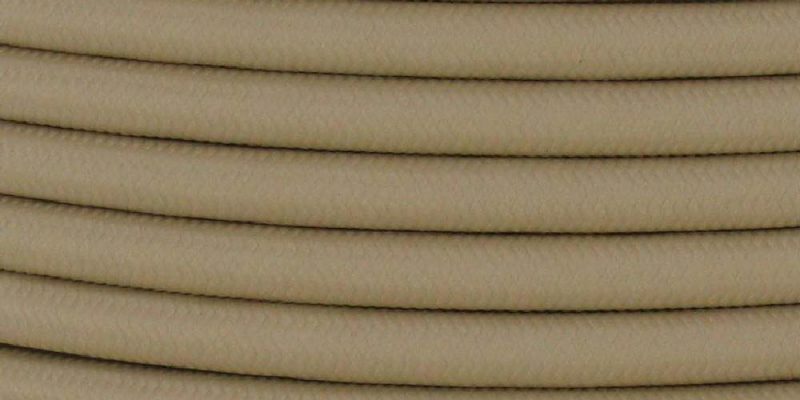 Lamp Wires are strips or lines made from materials that conduct electrical currents. 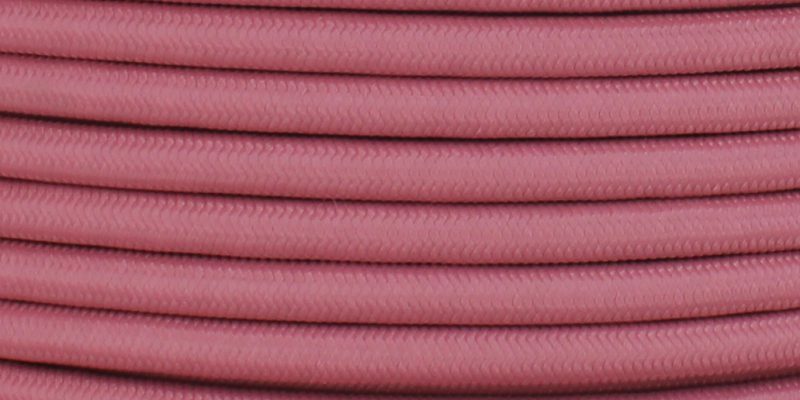 Also called lamp cord, these wires are used to carry electrical power to appliances or to send electrical signals between or within devices. On electric lamps, wires carry power to sockets. Within fixtures, wires usually run from a central box to the sockets by passing through arms, columns, or other piping. Before the arrival of electric lighting, people used a variety of tricks for navigating their neighborhoods at night. In The Downs, an area near the English Channel, patches of chalky soil were used as beacons known as down lanterns. In wooded areas, bark was strategically cut from trees to expose the lighter wood underneath. However, on most clear nights, the moon and starlight were strong enough to navigate at night. 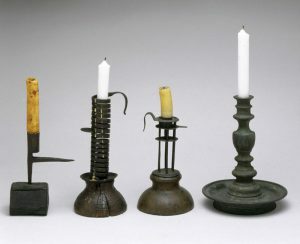 In the 18th century, candles and oil lamps illuminated many light fixtures in most homes and businesses. These early sources of illumination emitted a weak light, smoked, and gave off foul odors. They were also dangerous and required constant attention. Wealthy aristocrats used beeswax and spermaceti candles to light up their lavish households. The middle class used cheap tallow candles while the poor used rush lights, makeshift candles made from reeds dipped in animal or vegetable fat and ignited, which burned for a short time. In 1802, Sir Humphry Davy, an English physician, created the first electric light by passing a current through a platinum strip. The glow did not last long, but it marked the beginning of the history of light bulbs. 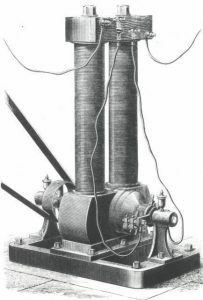 In 1809, Davy demonstrated the first carbon arc lamp at the Royal Institute in London by connecting two wires to a battery and attaching a charcoal strip between the other ends of the wires. While the scientific community and the public raved about the demonstration, the arc lamp burned too brightly and consumed a large amount of current, which quickly drained the battery and rendered the lamp impractical for commercial development and production. Several decades passed before electric generators made arc lamps practical for street and theater lighting. In 1835, the first constant electric light was demonstrated, and for the next 40 years, scientists around the world worked on the incandescent lamp, tinkering with the filament and the bulb’s atmosphere (whether air is vacuumed out of the bulb or it is filled with an inert gas to prevent the filament from oxidizing and burning out). These early bulbs had extremely short lifespans, were too expensive to produce or used too much energy. In 1841, Frederick de Moleyns received the first patent for an incandescent lamp in England. The lamp used a glass bulb, a partial vacuum and powdered charcoal between two platinum filaments to emit light. However, the lamp was not efficient enough for commercial use. The vacuum’s poor design caused the bulb to darken at the top and block light output, and the platinum filaments were too expensive. 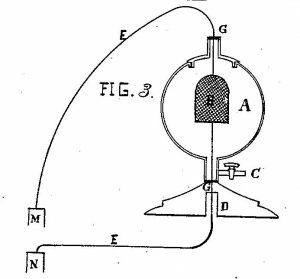 On July 24, 1874, Woodward and his partner, Mathew Evans, a hotel keeper, filed a Canadian patent application on an electric light bulb. It was granted on August 3, 1874 as Canadian patent number 3,738. Their light bulb comprised a glass tube with a large piece of carbon connected to two wires. They sold their U.S. Patent 181,613 to Thomas Edison. 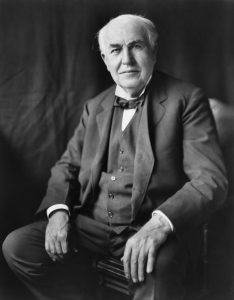 What makes Edison’s contribution to electric lighting so extraordinary is that he didn’t stop with improving the bulb; he also developed a whole suite of inventions that made the use of light bulbs practical. 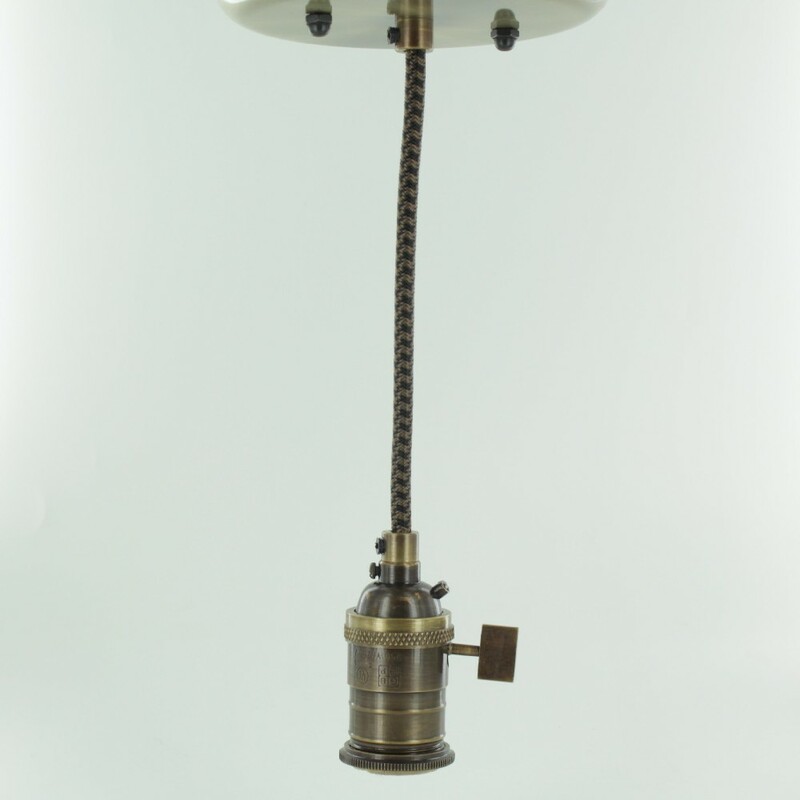 Edison modeled his lighting technology on the existing gas lighting system. Edison carried out experiments with over 6,000 filaments in order to pick the perfect one that would glow well and last a long time. In 1879 he changed the filament to a horseshoe shape to make it more durable. The patent of the filament was termed invalid three years later in the U.S because an English scientist, Joseph Swan, had already patented a similar light bulb in England some months before Edison. Edison and his team had extended Swan’s work on carbon burners/rods in an evacuated glass bulb. However, they hid this information from the judge and the patent was considered valid six years later. The reality was that Edison had only changed the terminology from rod to filament. Moreover, the patent was filed six months before Edison found a commercially viable filament. Despite this, his bulb was the only commercially viable light bulb. By 1880 Edison had patented his 16-watt light bulb which could last for 1500 hours. In 1882 with the Holborn Viaduct in London, he demonstrated that electricity could be distributed from a centrally located generator through a series of wires and tubes (also called conduits). Simultaneously, he focused on improving the generation of electricity, developing the first installation anywhere of the “Edison electric incandescent lighting system” on land. This took place at the Hinds, Ketcham & Company printing and lithography offices at 449 Water Street, New York City in 1881. This service install was what would become known as a “isolated plant” electric dynamo installation. When the Vulcan Street plant began operation in November 1882, it was the first Edison hydroelectric central station to serve a system of private and commercial customers in North America and used copper rods, wrapped in jute and placed in rigid pipes filled with a bituminous compound for wiring. 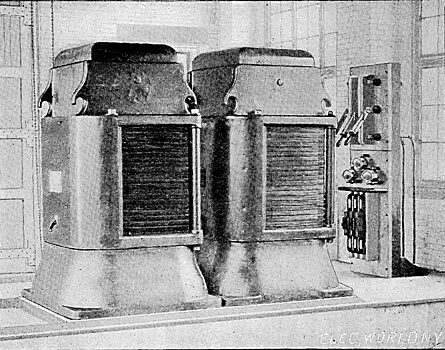 Prior to this plant, the Edison system of producing light from water-powered generators had only been demonstrated in exhibitions, and its application to commercial service had never been tested. The first power distribution system developed by Thomas Edison in 1882 in New York City H.J. Rogers, president of the Appleton Paper and Pulp Co. and of the Appleton Gas Light Co., initially heard of Edison’s plant for his first central station from his friend H.E. Jacobs. Jacobs, a representative of the Western Edison Light Co. of Chicago, described Edison’s steam-driven Pearl Street Station in New York City, and Rogers began to envision a water-powered plant along the Fox River in Appleton. Enthusiastically, he convinced A.L. Smith, H.D. Smith, a blast furnace owner; and Charles Beveridge, a banker, to join with him to form the Appleton Edison Light Co.
Two Edison “K” type dynamos were ordered and the first generator was installed as an isolated plant in the beater room of the Appleton paper mill. 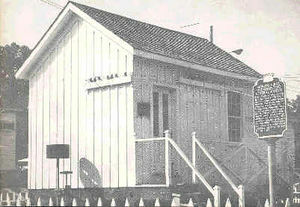 Rogers’ new home, the Appleton paper mill, and the Vulcan paper mill were wired, and each was directly connected to the generator. Few details of the venture were published at the time, and both the public and Rogers’ sponsors were skeptical about the chances of success. This was aggravated by a false start on 27 September 1882, when the dynamo was started-up but failed to light the lamps. Edward Ames, who had installed the generator, was summoned to correct the problem. On 30 September, they tried again. As the dynamo gained speed, the carbonized bamboo filaments slowly changed from a dull glow to incandescence. The “miracle of the age” had been performed, and the newspapers reported that the illumination was “as bright as day. Early operators of Rogers isolated plant encountered many problems and promptly conquered them with much ingenuity. Because of the varying load on the paper mill water beaters, the first generator ran irregularly, causing lights to grow inconsistently dim or bright. The condition was remedied by moving the dynamo to a lean-to off the main office, where it was attached to a separate water wheel. Since there were no voltage regulators, operators used their eyes to gauge the proper brightness for the lamps. Because there was little protection from surges, when storms or falling branches caused short circuits, the plant shut down until the trouble was discovered and corrected. And since there were no meters, customers were charged a fiat monthly fee per lamp. In 1882, service was from dusk to dawn, and customers often left their lamps burning all night. As more people turned to electricity for light, prices of both lamps and electricity fell. Older forms of lighting, such as candles and oil lamps, became used only for special occasions or emergencies like power “black-outs. 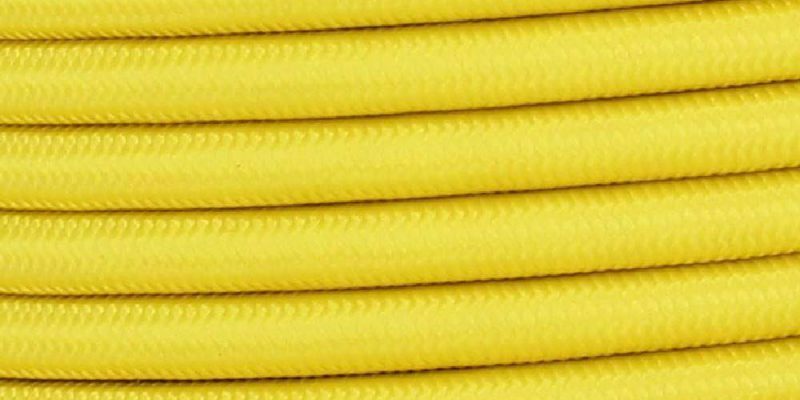 Although vulcanized rubber had been patented by Charles Goodyear in 1844, it was not applied to cable insulation until the 1880s, when it was used for lighting circuits. Rubber-insulated cable was used for 11,000 volt circuits in 1897 installed for the Niagara Falls power project. From about 1890 to the present, wiring methods have become much safer due to the installation types of wiring and the addition of ground wires. 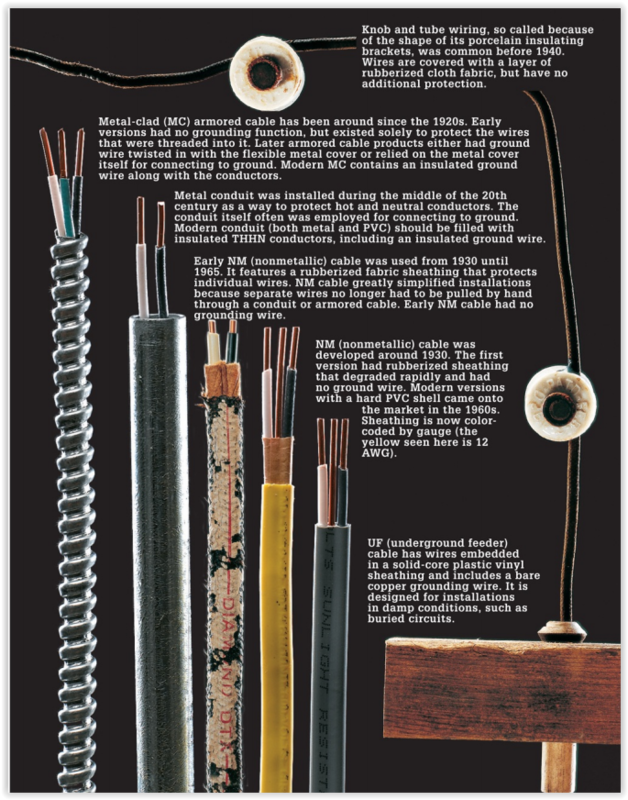 Between 1890 and 1910, knob and tube wire was all the rage in home building. By 1891 there were over 1,300 incandescent lighting central stations in the United States with a capacity of approximately three million lamps. When electricity was first introduced in houses, it was used primarily for lighting. A major factor slowed the adoption of electric light the need to install electric wiring. Nineteenth century construction materials and techniques often made this a very difficult and expensive process. The ability to use electricity for non-lighting tasks gradually became an important incentive for home and factory owners to make the investment. One common approach for other appliances (such as vacuum cleaners, electric fans, smoothing irons, and curling-tong heaters) was to connect them to light-bulb sockets using lampholder plugs. On November 8, 1904, Harvey Hubbell II patented the first detachable electric plug in the United States. 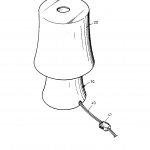 The Separable Attachment-Plug, US patent number 774,250, followed Hubbell’s electric switch design in 1891 and his patent for the pull-chain electrical light socket in 1896. “Hubbell’s detachable electric plug revolutionized the way electrical wires were connected or disconnected from a power supply. At the time post terminals would extend out from a wall and any type of electrical device had to be hardwired to the power source. Knob and tube wiring inside a 1930 Pittsburgh house. Towns and cities across the country competed with each other for the privilege of being the first in their area to gain access to the new technology. 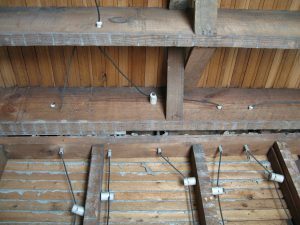 Individually insulated wires were held in place by porcelain insulating brackets. They also passed through wood in porcelain tubes that protected the rubberized cloth fabric from damage. This practice had a hot wire and a neutral wire that were run separately for safety and so they could be spliced together. To do this, the insulation was stripped back, a wire was wrapped around the exposed bare wire, and the splice was soldered together before being taped to cover the splice. The downfall was the wire was exposed to everything and there was no ground wire utilized. Rural electricification did not really begin to happen until a government organization was formed in 1933 known as the Tennessee Valley Authority, which used taxation to fund and organize the formation of publicly-owned non-profit rural electric cooperatives in the eastern United States. This work spread further, through the Rural Electricification Service of 1935, which worked to promote rural electrification, and the Rural Electrification Act of 1936, which provided federal loans to rural electric cooperatives formed across the rest of the United States. In the 1930’s, a quicker installation method was developed. 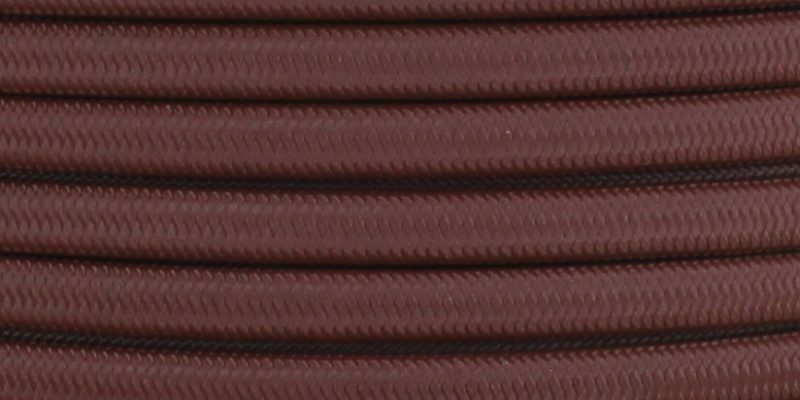 Nonmetallic-sheathed cable was born and it incorporated a rubberized fabric coating sheath, much like knob and tube wiring, but a hot and neutral wire were run together in this one sheath. It also had its drawbacks due to the lack of a ground wire. Luckily in the 1940’s, finally came the age of metal conduit. This invention allowed users to pull many wires in the same enclosure. 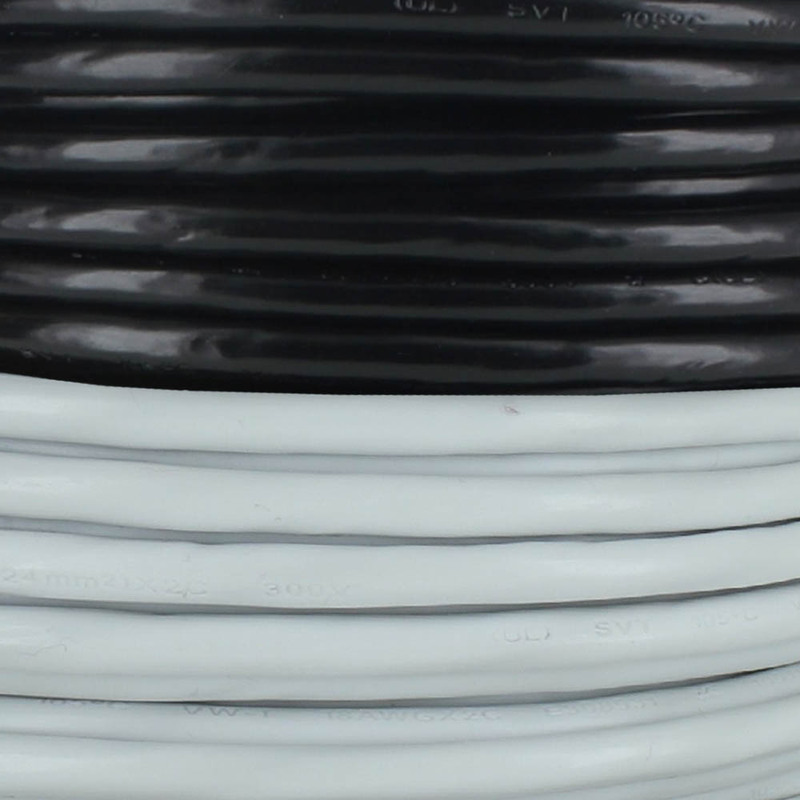 The conduit itself is considered a grounding method, but also leaves the possibility of space for a ground wire to be pulled. Conduit has been in use ever since those days and comes in many different types and sizes to be used inside and outside of your home. The newest addition to wiring was introduced around 1965 when it was recognized that the old wiring was getting dangerous and upgrade the entire house to, then, modern wiring. 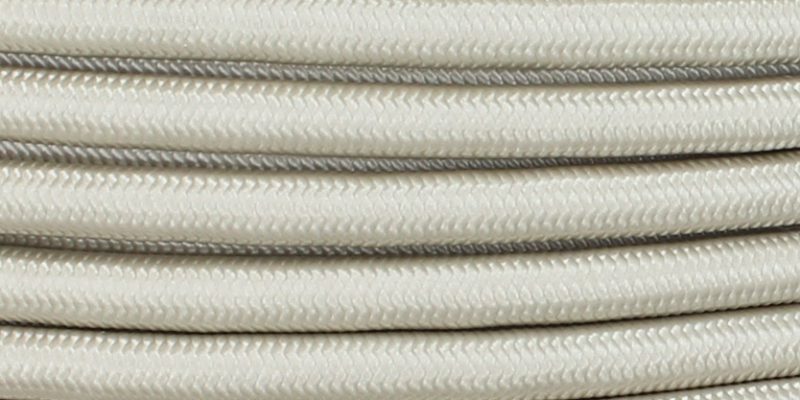 “Nonmetallic” or “NM,” wires, was an alternative to to wires sheathed in metal insulation, incorporated the use of a third wire, a bare ground wire run with a hot and neutral wire. 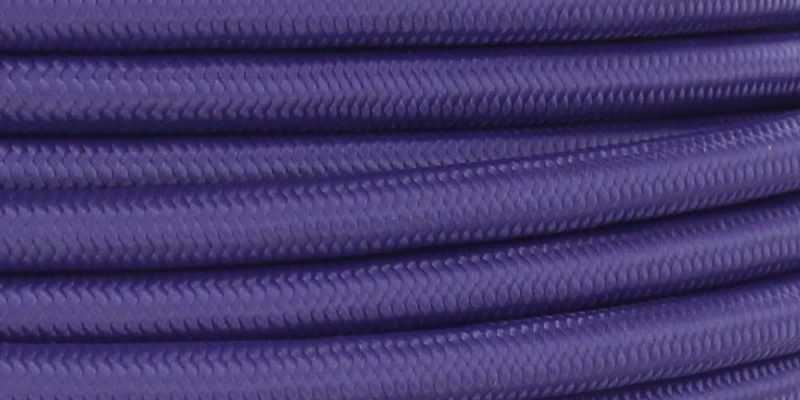 These three wires are all concealed in an outer sheath made of plastic vinyl. Unfortunately, at that time, modern wiring was made of aluminum which is considered dangerous enough to be banned in most residential applications since the late 1970’s. Gauge – A measure of a wire’s cross-sectional area. 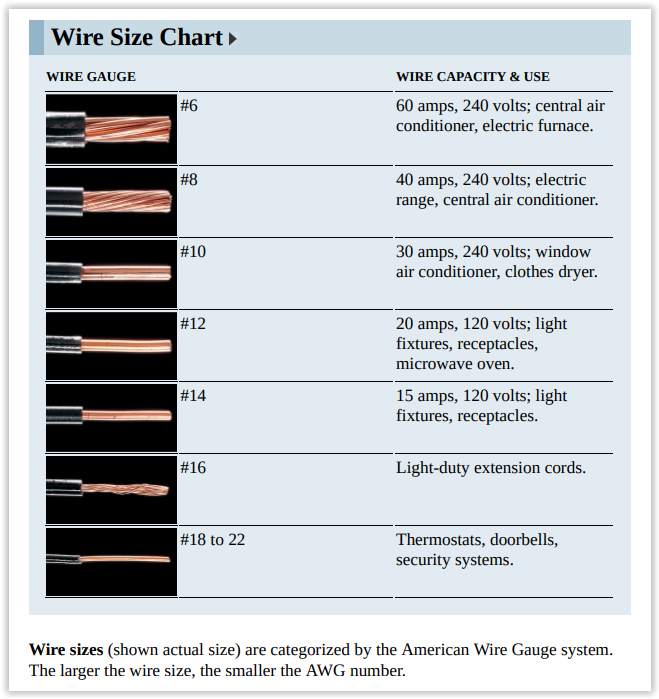 Lower gauge numbers signify larger-diameter wires. This is because the original method of measuring wire diameter was to pull wires through a pre-sized hole, and the thicker the wire, the fewer strands could be bundled together to fit. The wires that power the receptacles and light fixtures in a typical house are either 12- or thinner 14-gauge, and those in lamp cords are even thinner 18-gauge ones. 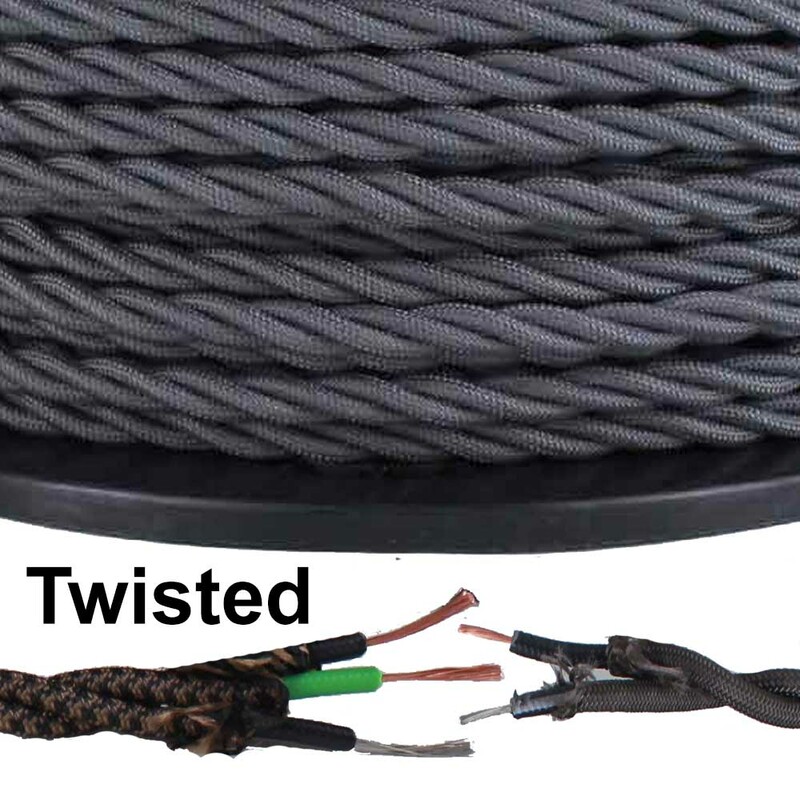 Unlike typical cables in a home’s electrical system, lamp cords usually contain stranded wire, which is wire made of several thin filaments bundled together. The higher the gauge number, the lower the wire diameter and thickness. 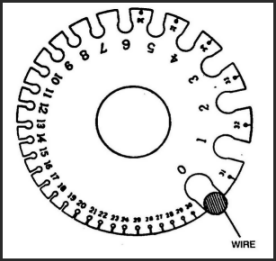 The reason for this is, a gauge is named after the total number of sizing dies the wire has to be drawn through to reach the required diameter. The AWG system also comprises tables for different parts. For example, you will find separate tables for solid, round conductors, and stranded wire. Increasing gauge numbers equals decreasing wire diameters. (22 gauge is thinner than 18 gauge). The larger the Diameter (Smaller Gauge Number) the more current handling capacity the wire will have. The Pressure that Pushes Electricity Through the Wire is Called Voltage (E) Measured in Volts. The Amount of Electricity Flowing Through a Wire when Voltage is Applied is Called Current (I) and is measured in Amps. The Power Consumed by the Light Bulb is Called Wattage (P) measured in Watts. 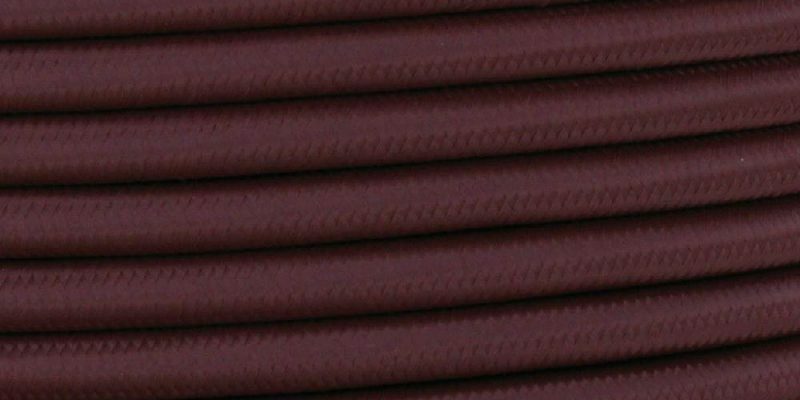 Whether in a powering a small device or the power lines providing electricity to an entire city, a conductor is the material that allows the free flow of electric current. In the case of the electrical circuit system, “conductor” specifically refers to the piece that transports the electrical current from the source to its load. What is a conductor made of? When an electrical charge is applied, metals provide the best conductive properties. This is the reason why metals are the conductor of choice in electric wires. Although we are all used to seeing copper as the most used conductor, the best metallic conductor is actually silver. But because of outrageous sticker price, copper is the most often used. Other metals—such as aluminum, gold, steel and brass—are also conductors, but they’re not considered to be as effective as copper and silver and using these metals may present other complications. 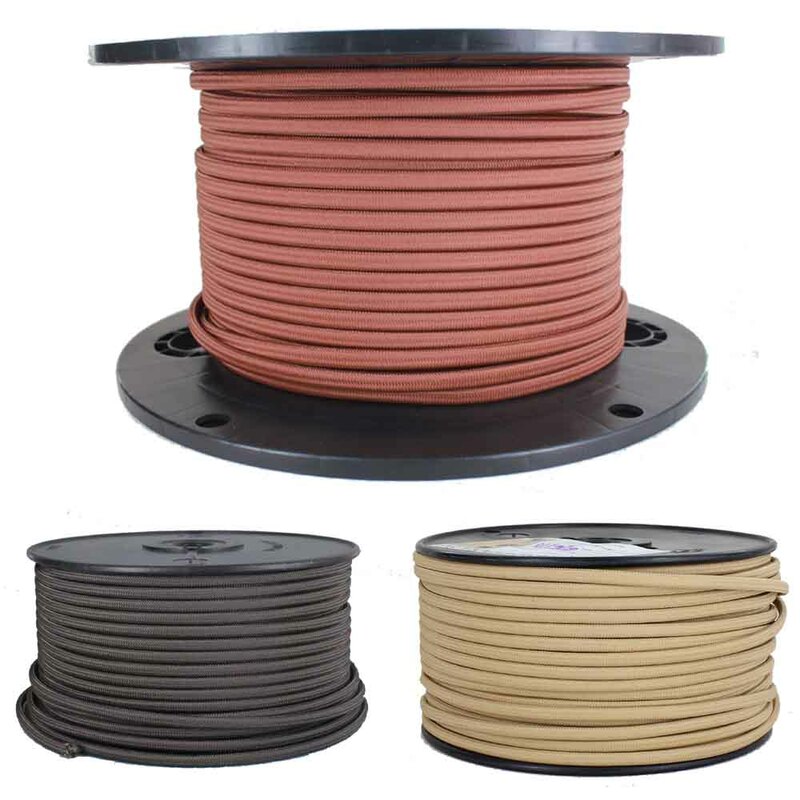 Three-conductor wire has three wires used for positive, negative, and a ground wire. 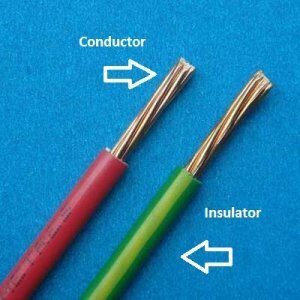 Two-conductor wire has two wires, either in parallel or twisted, one wire being used for the positive wire, one for the negative. 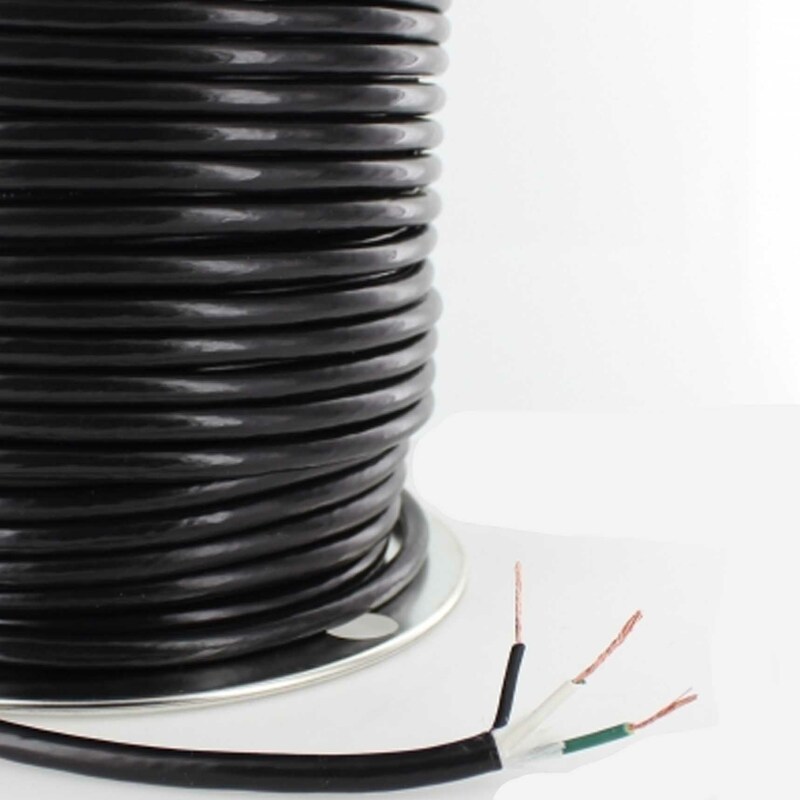 Single-conductor wire can serve as the positive, negative, or ground wire, but must be paired with at least one other conductor to wire a lamp or appliance. The term “ground” refers to a connection to the earth, which acts as a reservoir of charge. A ground wire provides a conducting path to the earth which is independent of the normal current-carrying path in an electrical appliance. The purpose of the ground wire (in U.S. terminology) is to provide a path back to the source of the electrical current — the main electrical panel — in the event of a fault. Hopefully this current is enough to trip the breaker or blow the fuse. As a practical matter in household electric circuits, it is connected to the electrical neutral at the service panel to guarantee a low enough resistance path to trip the circuit breaker in case of an electrical fault. Attached to the case of an appliance, it holds the voltage of the case at ground potential (usually taken as the zero of voltage). This protects against electric shock. The ground wire and a fuse or breaker are the standard safety devices used with standard electric circuits. 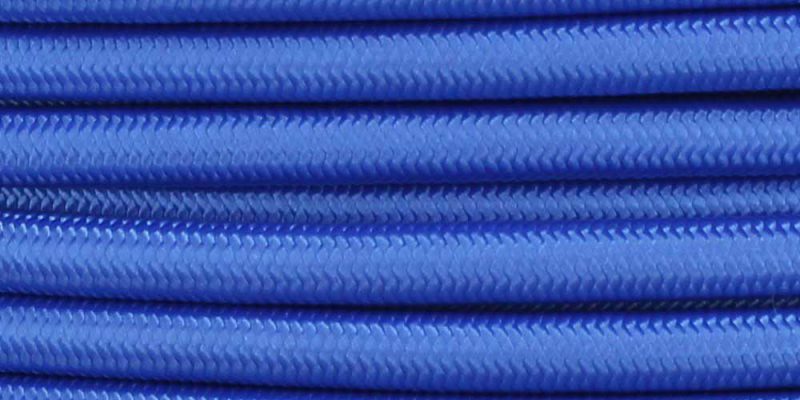 Polyvinyl Chloride. 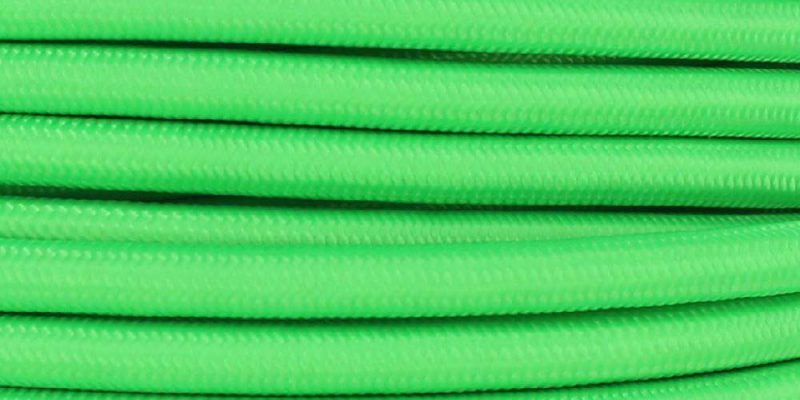 PVC is a thermoplastic made of 57% chlorine (derived from industrial grade salt) and 43% carbon (derived predominantly from oil / gas via ethylene). 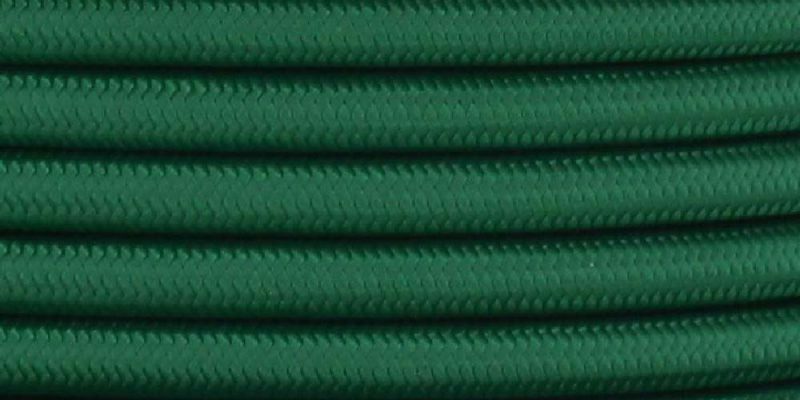 It is less dependent than other polymers on crude oil or natural gas, which are nonrenewable, and hence can be regarded as a natural resource saving plastic, in contrast to plastics such as PE, PP, PET and PS, which are totally dependent on oil or gas. This chlorine gives to PVC excellent fire resistance. 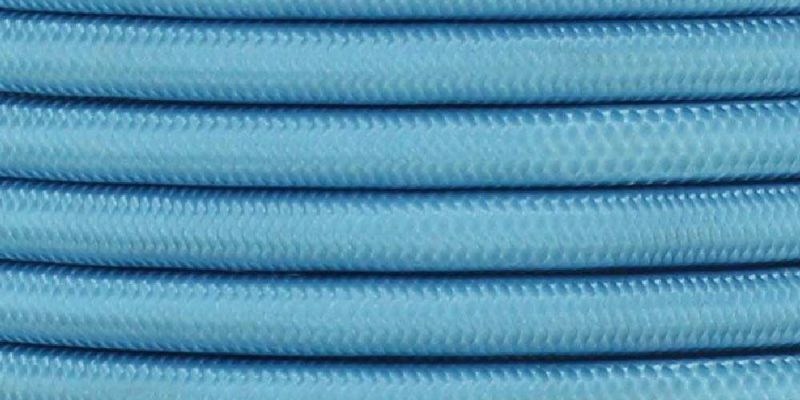 This makes it an excellent compound used for thermoplastic cords sets. 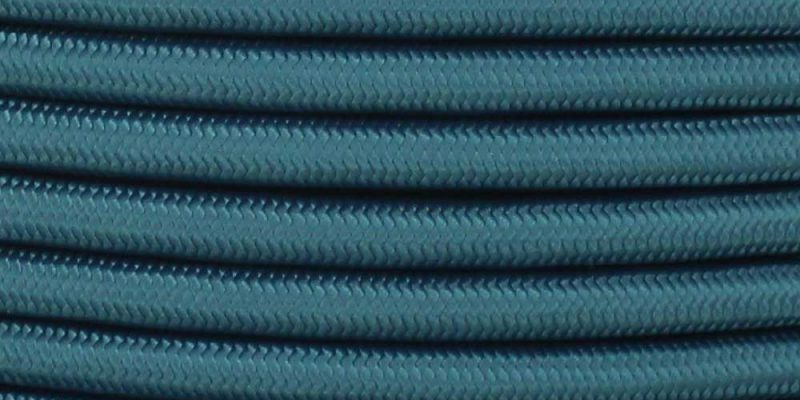 Cloth-covered cord with two or three conductors contained in one cord where the spiral of the twisted wires gives the cord a wonderful color and texture. 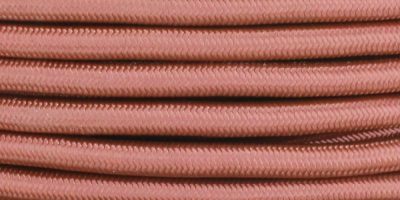 Overbraid wire is constructed using two or three stranded copper wires, each covered in PVC insulation, which are twisted together and braided with a cotton herringbone weave. 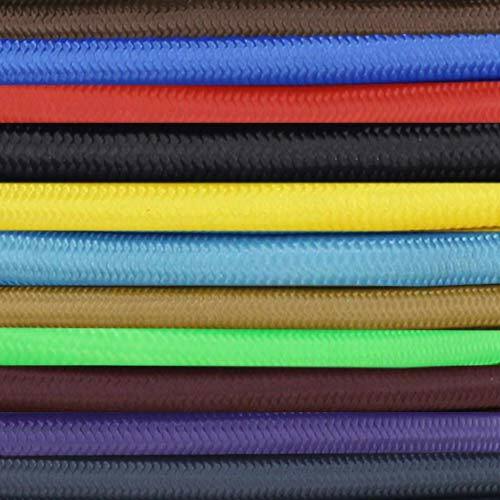 Overbraid cord can be used for table-top, floor, or pendant lighting as well as small appliances. Both silk and cotton were used as braid from the earliest days of electricity into the 1940s. The property they share is that they are shiny and, therefore, somewhat elegant. Cotton is matte, not shiny, and has a more down-to-earth, utilitarian look and is generally used for more utilitarian lighting and appliances. A braiding machine is device, which interlaces at least three strands of yarns or wires to form Fabric Cloth Covered Lamp Wire, covered power cords, and some types of lace. Braiding machines, although they have an apparent complex movement of bobbins, are mechanically simple and robust, modern versions are very reliable and consequently can operate for many hours or even days without much attention. Maypole braiders work by a circular braiding process. They were well suited to be driven by the steam engines of the industrial revolution and were common by the beginning of the 20th century being easily powered by electric motors. Common types of braiding machines work in much the same way as the process of decorating a maypole. At the start of decorating a maypole an even number of ribbons tied to the top of the pole. A group of people form a ring about the base of the pole and take a ribbon in hand. Half the people then travel clockwise and the other half counter clockwise. When the people pass one another they pass alternately to the right and to the left. This results in a downward forming braid on the pole. 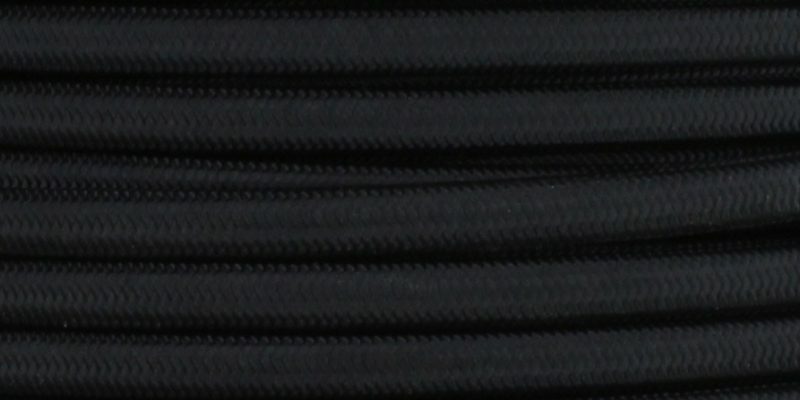 As the braid works its way down the pole, the ribbons become shorter and the angle of forming changes as the braid works lower on the pole. On a standard braiding machine, the supply lines are a constant angle and at a constant tension and hence the output braided product is uniform. In a horn gear braider, bobbins of thread pass one another to the left and right on pseudo-sinusoidal tracks, a peg at their bases is driven by a series of so called horn gears. A horn gear consists of a notched disk driven by a spur gear below on the same shaft. These gears lie below the track plate that the bobbin carriers ride on, and an even number of gears must be used as there are always an even number of bobbins. The gears must be driven at multiple points on machines with two or more bobbin sets and cross-shafts are used. 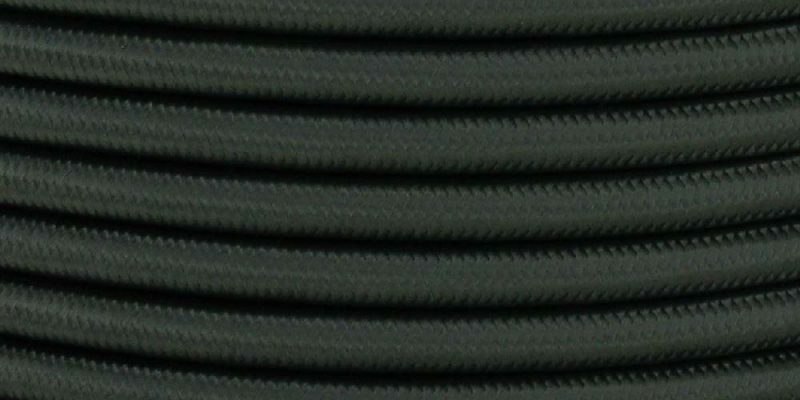 On a vertically oriented machine, the braided thread is taken up above the machine and height and diameter of a guide ring determines the characteristics of the braided product to some degree. On horizontal oriented machines, the braiding track plate and associated bobbins are turned through 90 degrees. This enables large stiff braided cables to be output horizontally so a tall factory building is not required. Braiding machines, although they have an apparent complex movement of bobbins, are mechanically simple and robust. Modern versions are very reliable and consequently can operate for many hours or even days without attention. This has enabled factories with hundreds of machines to be operated by just a few workers, reducing wages, and making products cheaper and/or profits higher. These modern machines have incorporated electronic controls with automated controls. 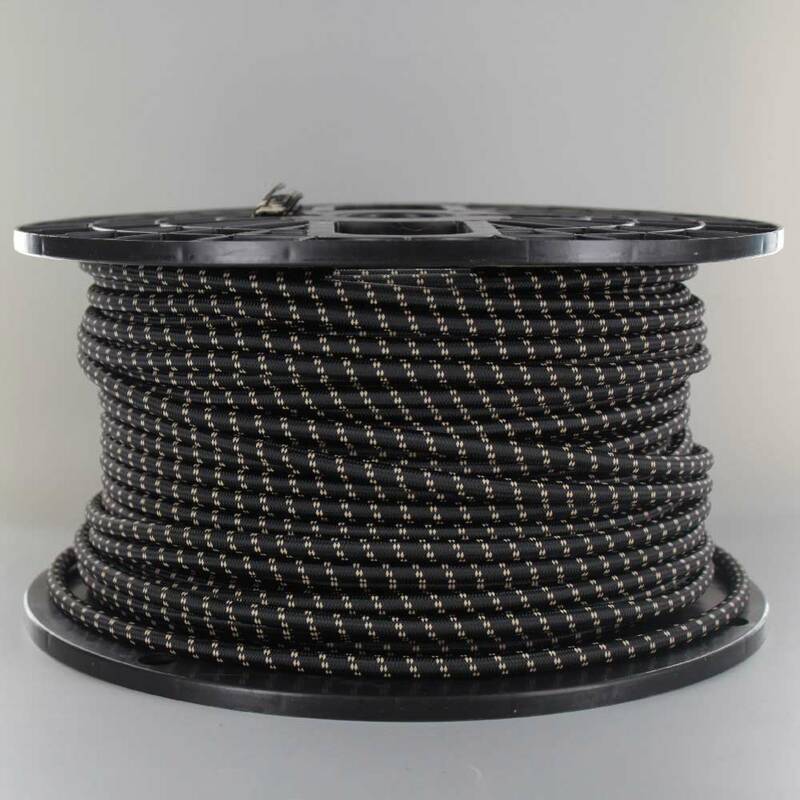 Although ropes, cords and fishing line are still the core products of most braiding companies there are many other products including webbing, cable shielding and automotive products such as reinforced brake lines. 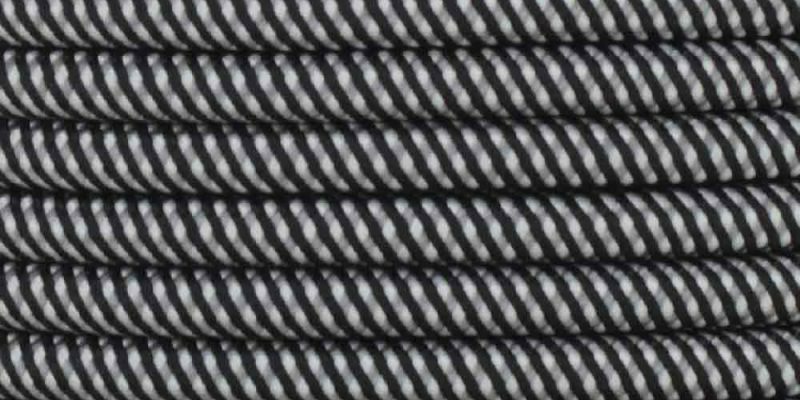 Some machines use a different system, where the motion of the thread carriers resemble a Teacup Ride. 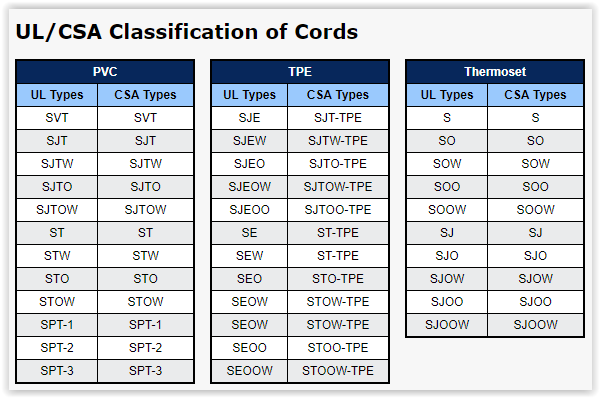 SJT Cord is hard usage service cord designed for use with heavy tools, equipment, portable lights and power extensions. It is also used with large appliances and lighting installations. 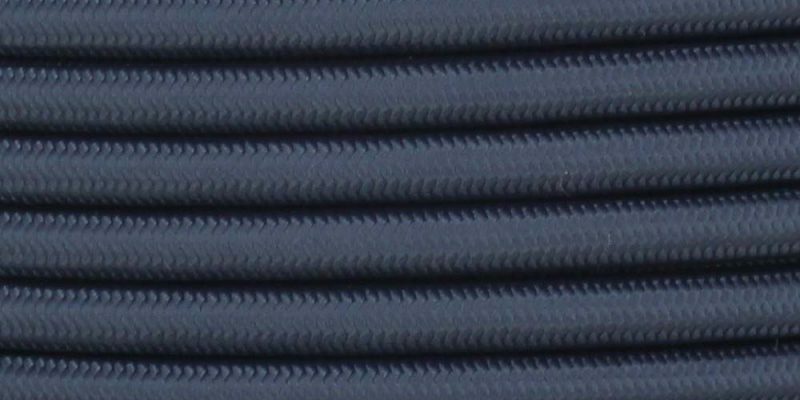 Thermoplastic constructed jacket. 300 volt, weather resistant for outdoor use. 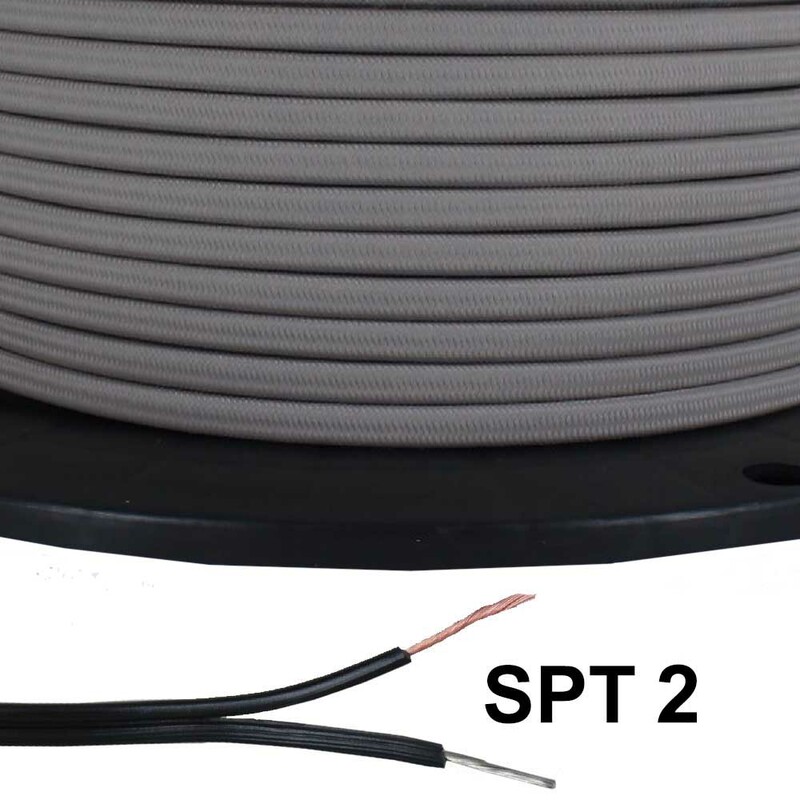 SPT – SPT Cable can also be called lamp cord or lamp cable because the two conductor construction is easily recognizable as the cord used in lamp wiring. 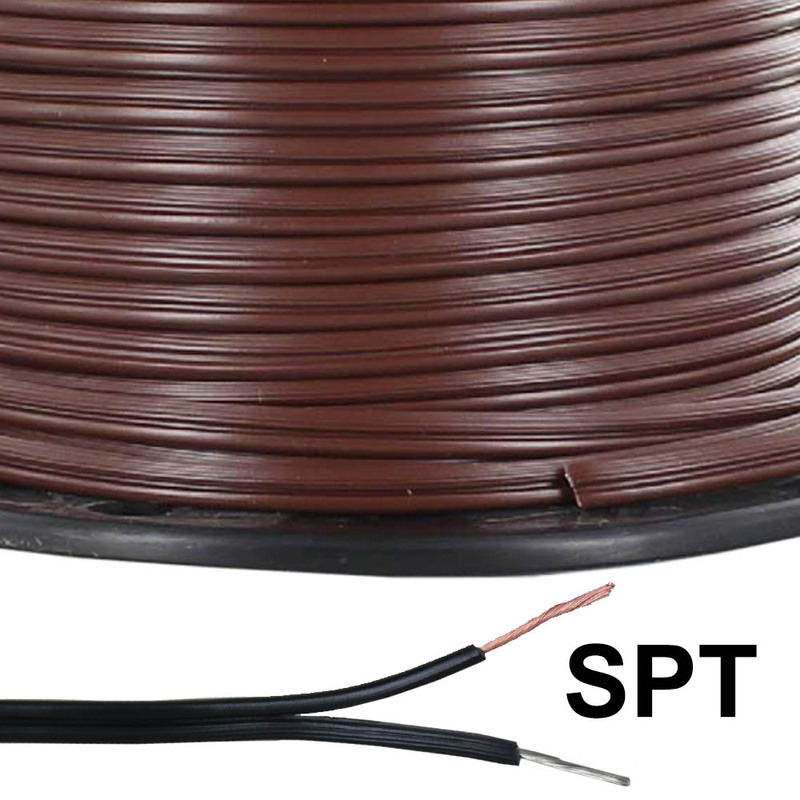 However, SPT cable can also be used in clocks, radios, fans, refrigerators and room cooling units among other things. 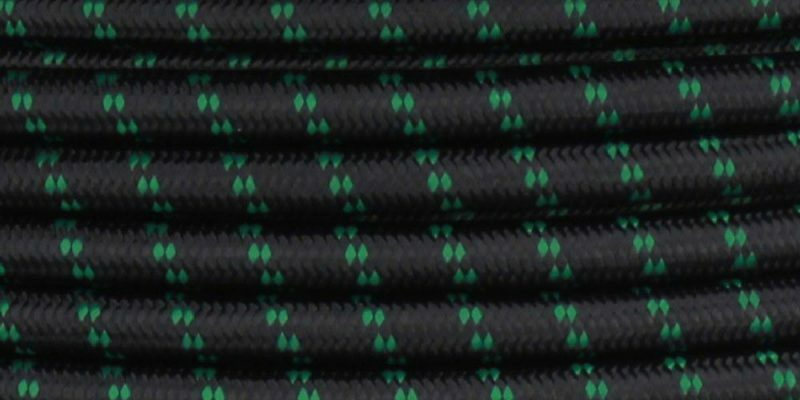 SPT, also known as zip cord, is short for Stranded Parallel Thermoplastic. This means the two wires (Hot & Neutral) run parallel to each other in an insulated Thermoplastic cover. This wire is U.L. Listed for use in hanging fixtures & sconces, easily slips 1/8IPS (3/8” dia.) pipe. 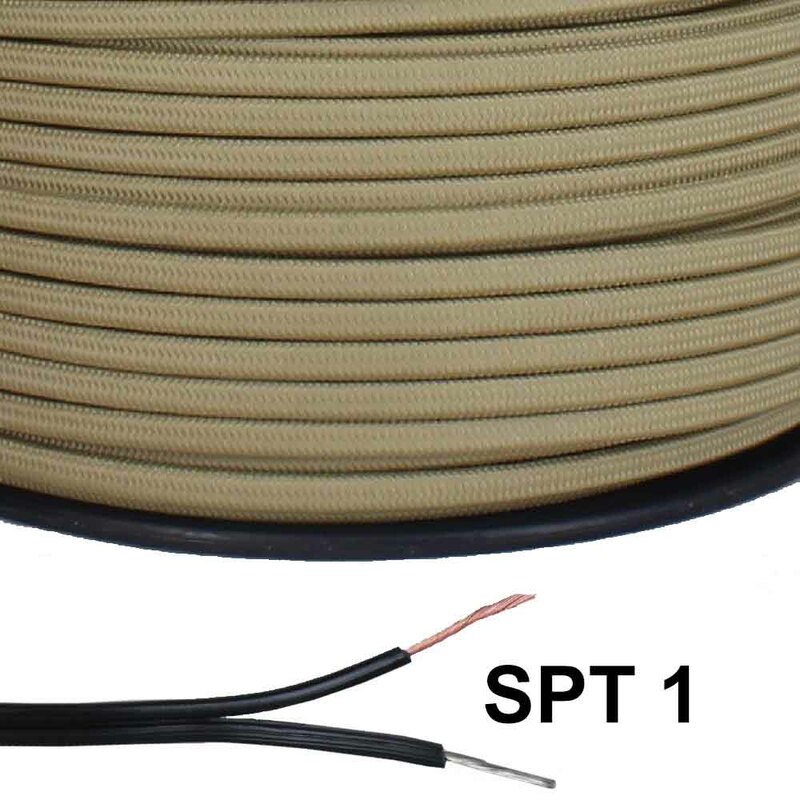 This cord is made with the same gauge wire as SPT-1, but its insulation is thicker. BEST USE: table and floor lamps in UL Certification situations only. 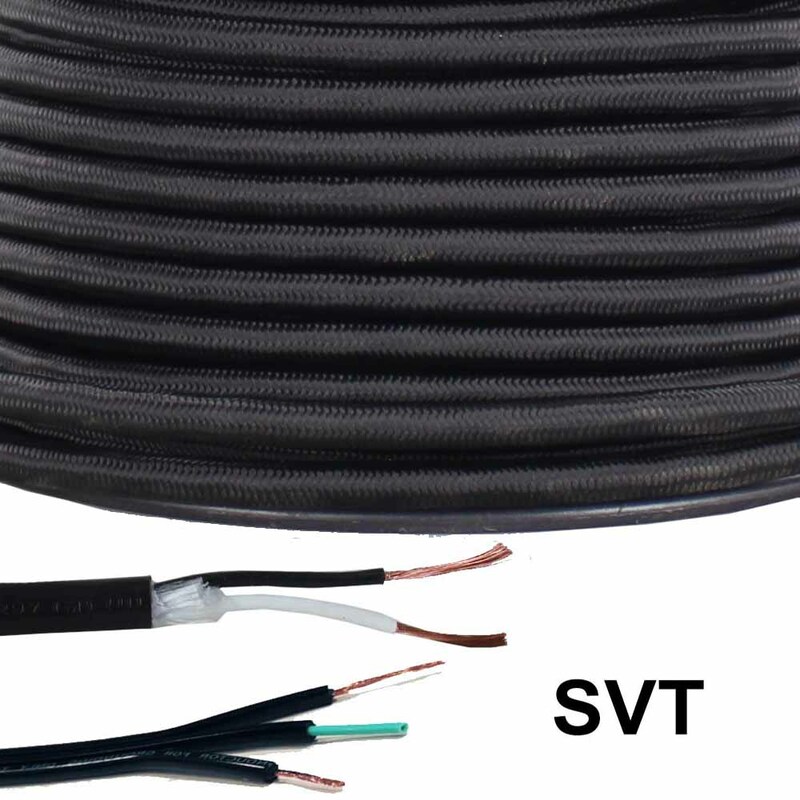 The name SVT came from its original use Service Cord Type Vacuum Cleaner Thermoplastic, but is now used on lamps as well as other small appliances (i.e. : desktop fans). 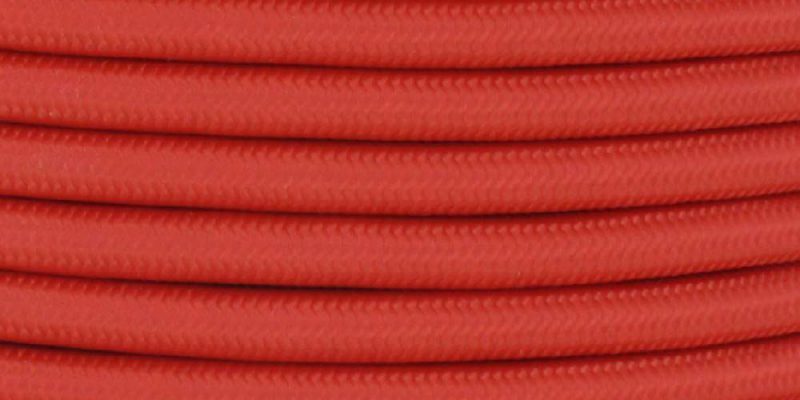 It’s a round cord that is perfect for hanging pendants, as the double insulation (the outside layer and the individually insulated interior wires) can hold more weight than the SPT cords. 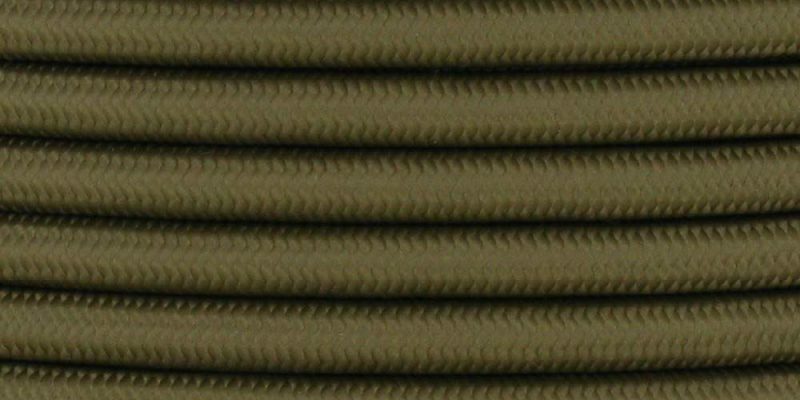 Parallel cord is a flat cord. 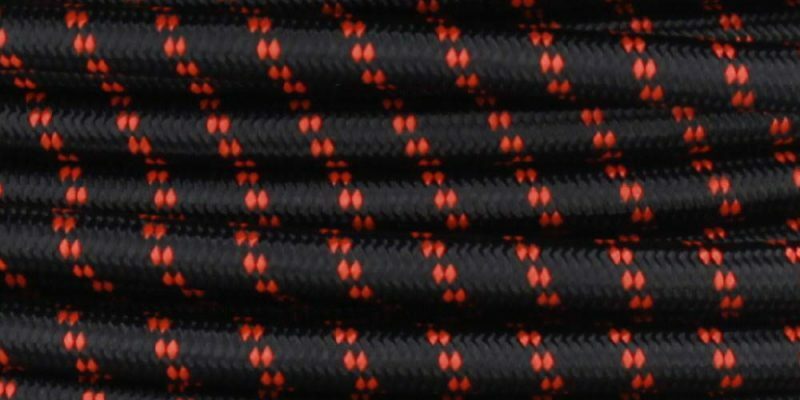 Constructed from SPT-1 cord, which is two wires, side-by-side, bonded together by the PVC insulation to create one cord. 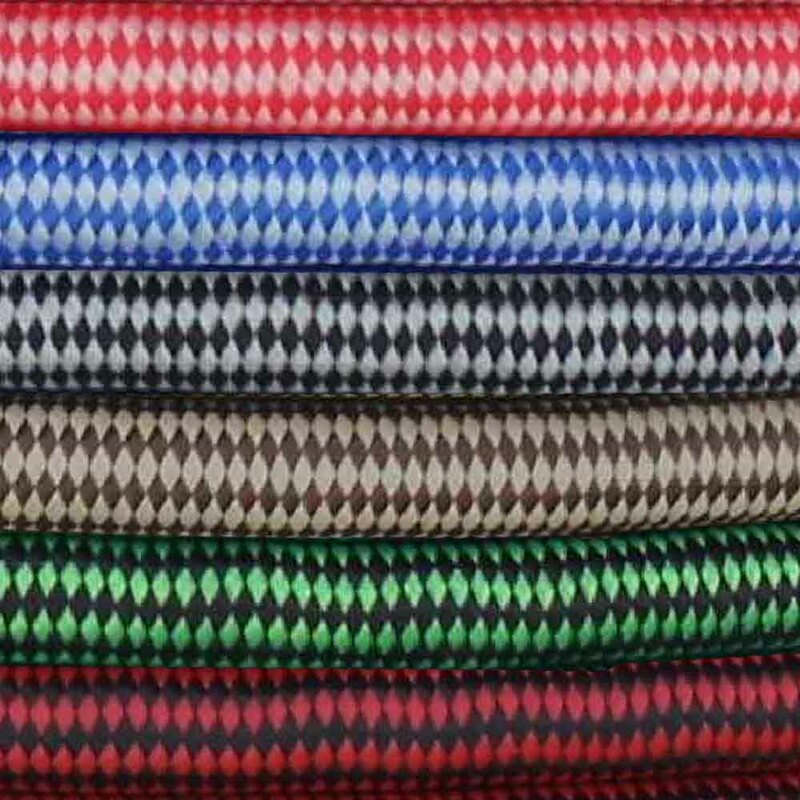 This insulated cord is covered in rayon or cotton herringbone braid. Each of the two conductors is covered in cloth braid and then the wires are twisted together. Available with 2 Wire or 3 Wire twist in several colors and patterns. 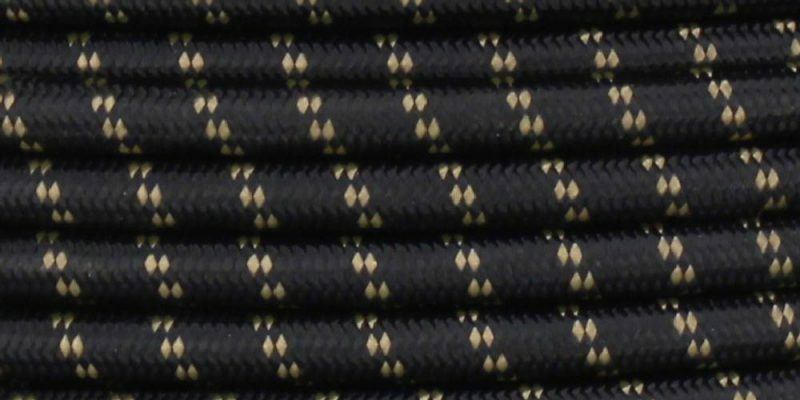 A tracer is a small amount of a yarn of a different color from the main color of the braid which is woven in at intervals. The use for this, in the days before plastic was between the braid and the copper wire, was to be able to differentiate which conductor was which at each end of the wire, so the electrician could easily know that he was wiring positive to positive and negative to negative. 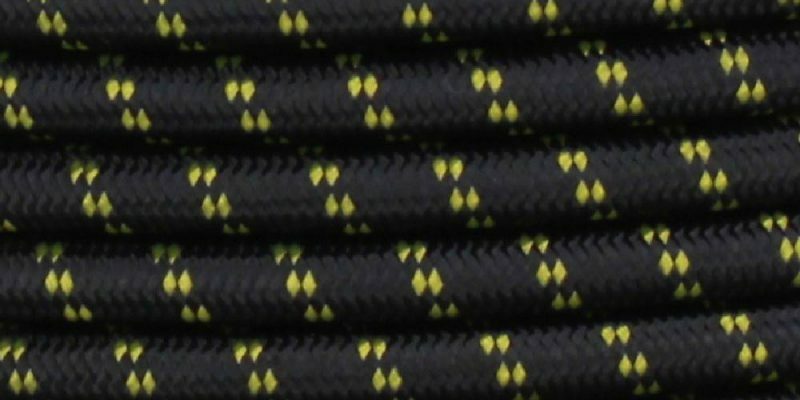 Now the PVC under the braid is always differentiated, either by each conductor being a different color or by one of a pair of conductors having a stripe in the PVC. Underwriters Laboratories (U.L.) 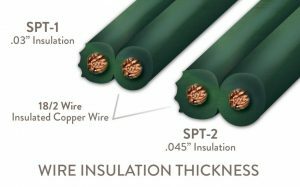 issues standards for lamp cord manufacturers that specify wire gauge (size) and insulation thickness/durability. 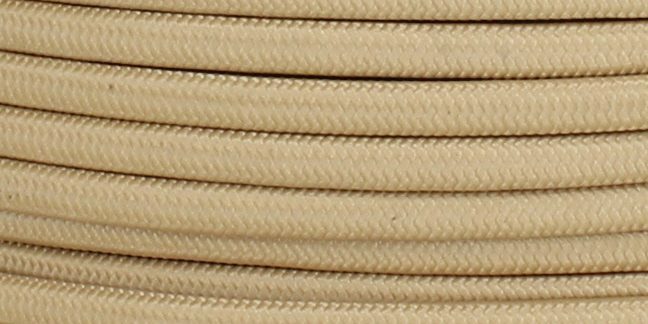 These specifications translate into the numbers that you see in our product descriptions for lamp cord and appear in very small lettering on the lamp cord itself. HOW MUCH WATTAGE CAN I PUT ON A LAMP WIRE? 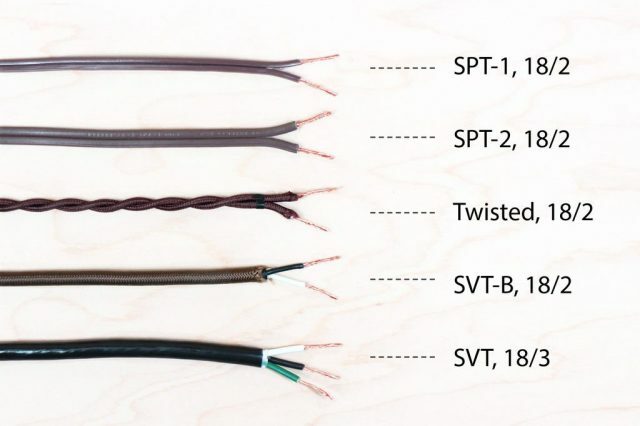 WHICH TYPE OF WIRE SHOULD I USE? 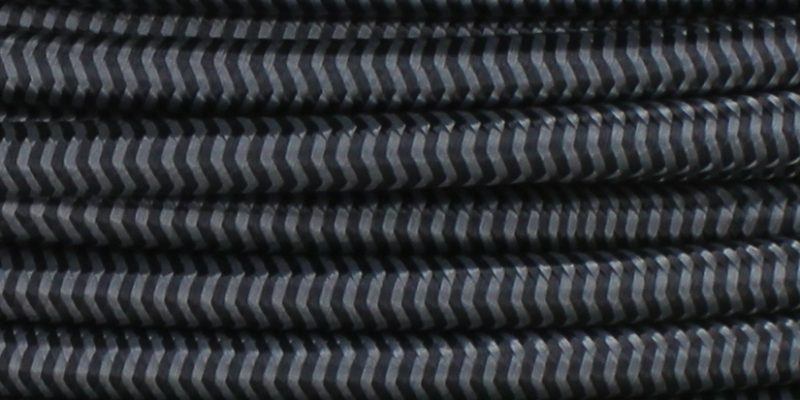 The Type of Wire to be Used is determined by the application. 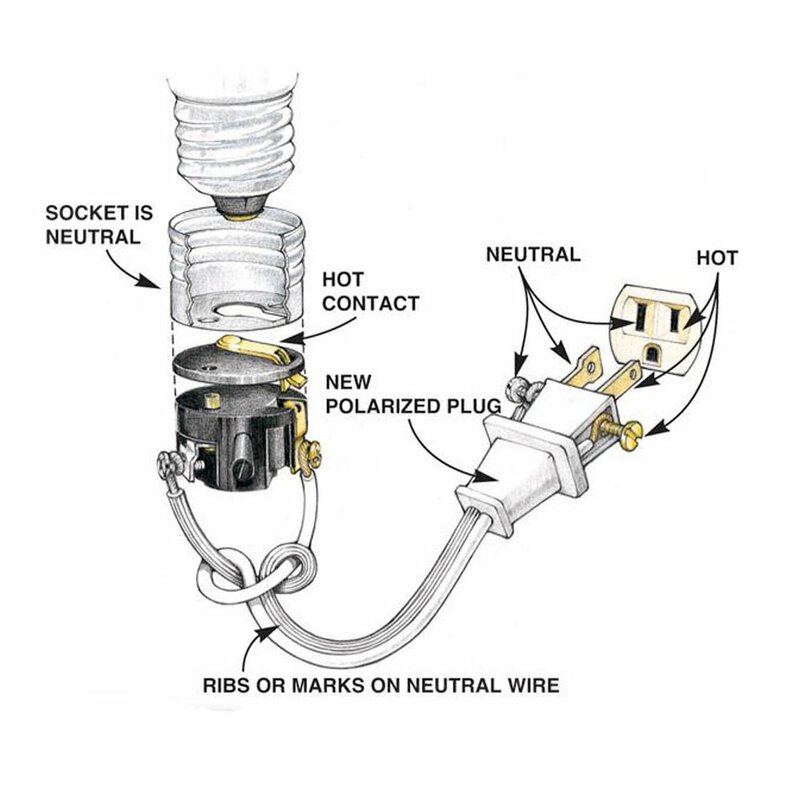 Exterior from Base of Lamp to Plug – Use SVT or SPT-2 or Equivalent Type Wire. Note: Many Older Table Lamps use SPT-1 on the Exterior. Fixtures 5 lbs or less – Use SVT Type Wire with proper Strain Relief Bushing. Fixtures 10 lbs or less – Use SJT Type Wire with proper Strain Relief Bushing. 22/2 PLT is not U.L. Listed. 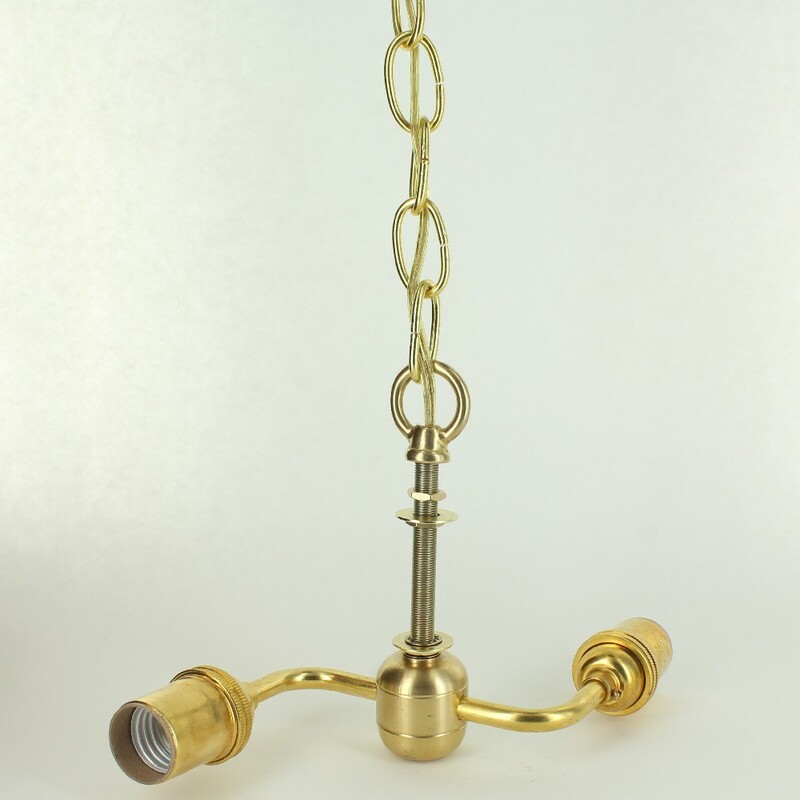 We recommend it for very limited use in rewiring antique lighting fixtures when you have no other choice. Never use more than 60 watts at 120 Volts. 20/2 PLT is not U.L. Listed. We recommend it for very limited use in rewiring antique lighting fixtures when you have no other choice. Never use more than 75 watts at 120 Volts. 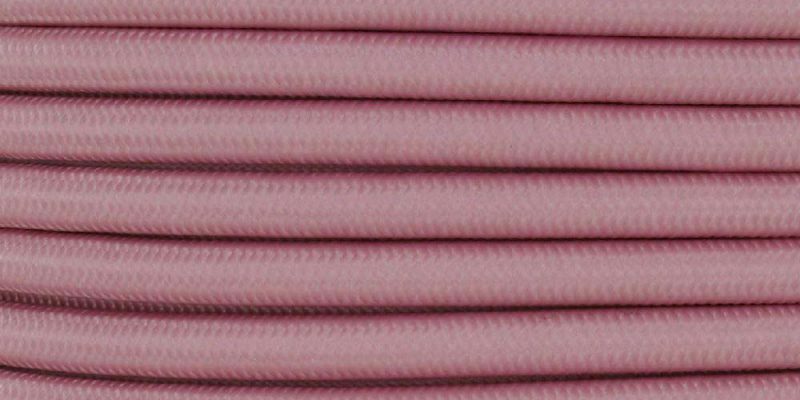 To complement our electrical wire and lamp cord supplies, we also stock canopies and other lighting parts to cover all your lighting parts shopping needs. You may also want to view our range of Lamp Sockets , Lamp dimmers, and lamp switches to help complete the job. Powered by Grand Brass Lamp Parts, LLC.